Welcome back YAHS alum Katherine Siochi! We have very exciting news to share. YAHS alum and Sarasota Orchestra principal harpist Katherine Siochi will be joining us as a special guest at YAHS 2018! Katherine will join us for a concert on July 6, a workshop, and private lessons during week one of YAHS and Prep 2018. We first met Katherine when she attended YAHS at the age of 12, and we are proud to call her a YAHS alumni and returning student! Since her time with us Katherine has had an extremely successful career. She attended Juilliard, where she studied with YAHS 2018 guest artist Nancy Allen, and then went on to win the Young Professional Division of the American Harp Society Competition, making her the AHS Concert Artist in 2015–2017. 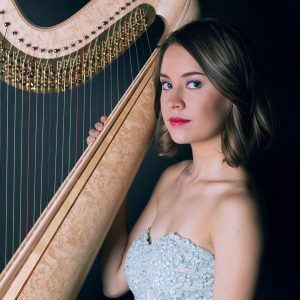 In 2016, she became only the second American to win the Gold Medal at the prestigious USA International Harp Competition. Katherine told us that performance classes and mock auditions at YAHS helped her learn how to focus on stage and during auditions. Now that she’s the new principal harpist with the Sarasota Orchestra, we can’t help but feel a little bit responsible in helping her get there :-). Look forward to meeting and working with Katherine this summer at YAHS 2018!